The approval rating of Russian President Vladimir Putin has reached a new height in October, totaling 89.9 percent, surpassing the previous record height of 89.1 percent in June, VTsIOM reported. "Such a high approval rating of the Russian president's activity is linked primarily to events in Syria and airstrikes of the Russian aviation on terrorist positions. A total of 26 percent of respondents named these events as the main ones in the past week," VTsIOM's press service said in a statement. 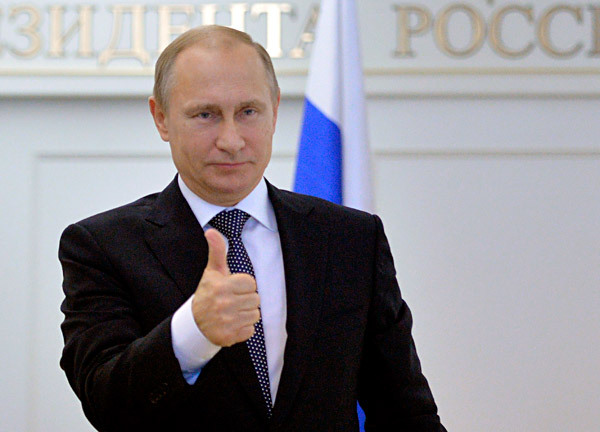 Sociologists note that Putin's approval rating has been higher than 80 percent for more than 18 months. "Putin's rating began to grow in spring 2014 against the backdrop of the reconnection of Crimea and Sevastopol with Russia: it was 76.2 percenton average in March 2014, 82.2 percent in April and 86.2 percent in May," VTsIOM said. The poll conducted among 1,600 respondents in 130 communities of 46 Russian regions was held on October 17-18.